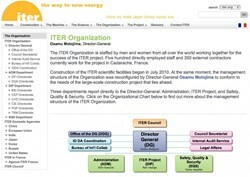 We've updated an important section of our website: the Organization pages that illustrate the structure of the ITER Organization and its myriad departments, directorates and divisions. 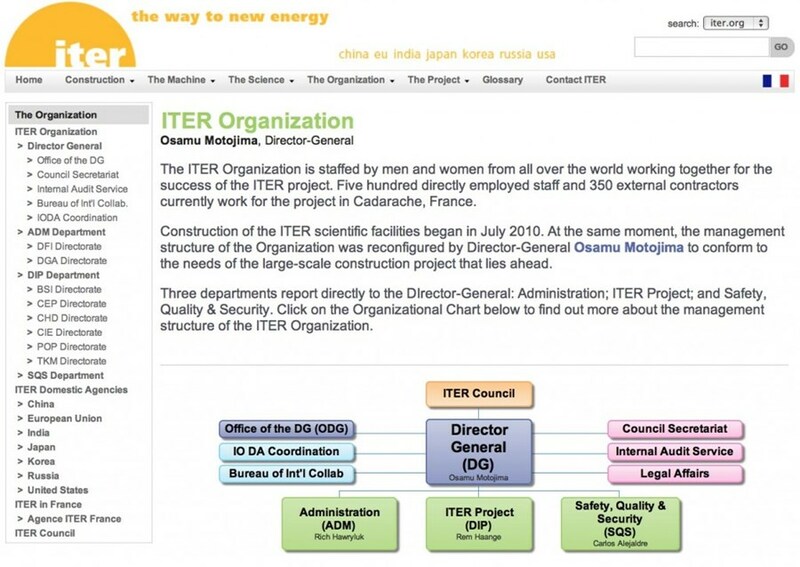 The new pages reflect organizational choices made by ITER Director-General Motojima following his appointment in July 2010 for "a simplified, task-oriented management structure to match the needs of a large-scale construction project." The position of Principal Deputy Director-General was eliminated and the number of departments downsized from nine to three (the Departments for Administration; ITER Project; and Safety, Quality & Security). The revised ITER management structure is now complete. As you navigate around the pages you'll meet the groups, small and large, that make up the ITER Organization and see the people behind the project—from seven Members, representing 27 nationalities—who are working in Cadarache, France to build ITER.